Reynolds, who has spent more than 20 years with the university, runs a police department entrenched in community. Under his leadership, UNT police officers maintain a safe environment on campus while providing excellent customer service and encouraging strong community involvement. Under Reynolds’ leadership the UNT Police Department regularly engages with the campus community with events like Pizza with the Police and Coffee with the Cops. Reynolds and his officers often collaborate with key student organizations to improve safety and security, such as Sgt. Kevin Crawford and UNT student Christianna Walker’s efforts to address interactions with members of the autism spectrum community. The department also offers free u-lock giveaways, more than 200 free safety awareness trainings each year and a revamped self-defense program. Reynolds was named chief of police in 2015, following a brief stint in an interim role. 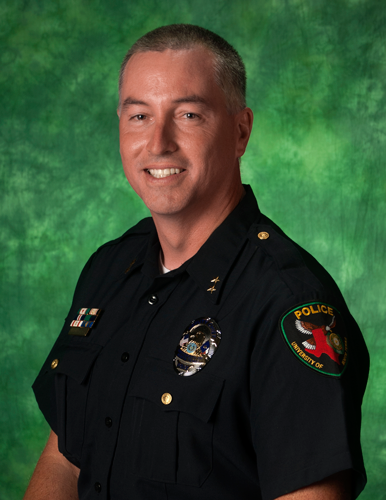 He joined the UNT Police Department in 1994, working his way through the ranks and supervising every division – patrol, criminal investigations and administration, before earning his current post. A second-generation law enforcement officer, Reynolds led the department’s successful effort to earn national accreditation in 2006 by the Commission on Law Enforcement Accreditation and the International Association of Campus Law Enforcement Administrators, a distinction that fewer than 7 percent of law enforcement agencies nationwide achieve. The department continues to earn its reaccreditation. A graduate of the UNT Police Academy, Reynolds earned an associate degree in criminal justice from North Central Texas College and a bachelor degree in criminal justice from UNT. He also earned a master peace officer, firearms and instructor license from the Texas Commission on Law Enforcement.